ORIGINALLY POSTED AS AN ARTICLE HERE. This is an archive of Irish Story articles on the 1916 Rising from 2010 and 2011, including articles, interview and book reviews. Look out for more contributions on the Rising here in 2012. 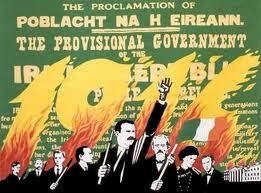 * An Overview of the Easter Rising – laying out the need-to-know facts. * ‘Slaves or Freemen’, Sean McDermott, the IRB and the psychology of the Easter Rising, tries to delve into IRB thinking about nationalism and revolution before the rebellion. The first day of the Rising – April 24. The rebels occupy their positions, both the British and the Dublin public are taken by surprise. The next day, Tuesday the 25th. Fighting continues, civilians suffer. By Eoin Purcell. The Battle at Mount Street, April 26th. The bloodiest day of the Rising for the British, at Mount Street Bridge. The Surrender – April 30th, 1916. Over three days, the rebels in Dublin and elsewhere surrender. *Cathal Brennan’s article –A TV pageant – the Rising commemorations in 1966 – looks at the public marking of the Rising 50 years later. Fearghal McGarry on the Easter Rising – historian Fearghal McGarry discusses his book ‘The Rising’. Perspectives on the Easter Rising, Part I, Rebels – Fearghal McGarry and Padraig Yeates talk about the planning of the Rising. Perspectives on the Easter Rising Part II, Combat – McGarry and Yeates talk about the fighting in Easter week. Perspectives on the Easter Rising Part III, Aftermath – McGarry and Yeates discuss the long term and short term consequences of the rebellion. 1916 A Military Falure? – Author Paul O’Brien gives his thoughts on the Rising as a military operation. Rebels by Fearghal McGarry, Reviewed by John Dorney – a collection of eyewitness testimony from veterans. A City in Wartime by Padraig Yeates, Reviewed by John Dorney. This book on Dublin in 1914-18 contains a meaty chapter on the Rising. Turning Points in Twentieth Century Irish History – Reviewed by John Dorney – Includes a provocative chapter by Peter Hart on 1916. Unlikely Rebels by Anne Clare – On the Gifford sisters and their role in the Easter Rising. Reviewed by Mairead Carew. The Story of the Easter Rising, By John Dorney, Reviewed by Cathal Brennan. The Rising, Ireland, 1916, by Fearghal McGarry, Reviewed by John Dorney. Written by: Eoinpurcell on 8 April, 2012.